As mentioned in a previous blog, the drivers of economic development are changing from directly growing jobs and investment (“business development”) to those that are designed to improve the quality of place in order to promote the retention and attraction of talent, which in turn drives growth in jobs and investment. 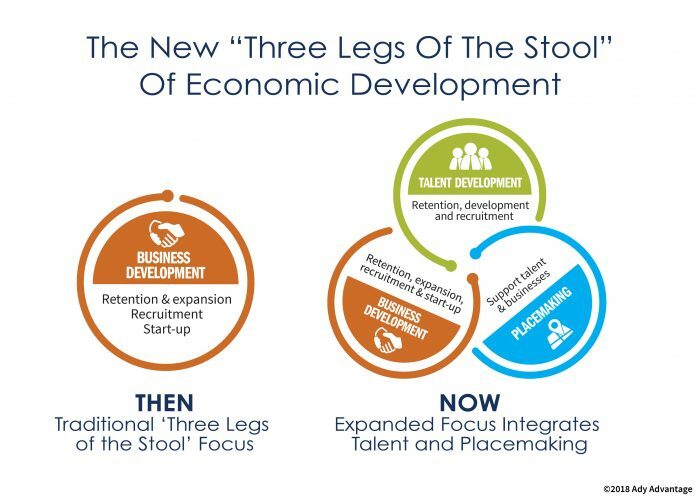 The traditional “three legs of the stool” (business retention/expansion, recruitment and start-up) now become one leg of the stool, along with talent development and placemaking. Chances are that you have already reacted to some of these forces. Many EDOs have numerous talent programs and initiatives underway. However, because they are not thinking of their scope of work in the context of the new three legs of the stool of economic development, these talent programs are band-aided under BRE or business recruitment because they don’t really fit anywhere else, but the ED professional knows that they need to be tackled. Another symptom suggesting that you need to move to the new framework is if you’re being pulled into housing, transportation, and child care issues. You might be asking yourself, “Isn’t that traditionally the role of community economic development, or workforce development, or somebody other than economic development?” Yes, it has been. But because these are the three big barriers to talent retention and recruitment, they are now on the radar of ED professionals. Placemaking 360™ – An action plan to enhance the foundational and differentiating aspects of quality of place that uniquely make your location desirable to targeted people. Talent 360™ – A sweeping view of your people assets overlaid with the skills that your future industries will require. Business Development 360™ – A nuanced view, based on talent-led target industry analysis, that identifies those industries and companies to retain, expand and recruit. Economic Development 360™ leverages each of the above to create a comprehensive approach to strategic planning. By organizing strategic approaches along these three components, goals and strategies are targeted and tailored to each “leg” of the stool. Economic Development 360™ is an ambitious effort, but leads to outcome-driven goals with a holistic approach, addressing today’s economic development needs. Contact us to find out how we can help you create an economic development strategic plan that is in tune with the new three legs of the stool of economic development.